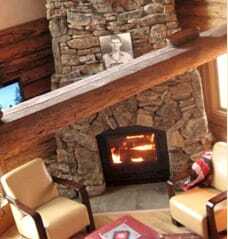 Our Z-MAX Fireplace is a zero clearance wood-burning fireplace that offers a 27” x 19” viewing area! It has up to 130,000 BTUs/hour, a burn time of up to 10 hours and has the capacity to heat up to 3,000 square feet! Read our blog to learn more about Whole Home Heating with the ZMax! The Z-MAX has one operable door. Construction of the door consists of high temperature ceramic glass, with a lifetime warranty, gasketed to a rugged 22 pound door frame. The door latching system is double-pinned (top and bottom) for a long term tight seal. The air within your home is drawn in the bottom into the louvered vent by a thermostatically controlled 220 CFM fan. It is forced through the back air passage of the system, heated, and then circulated through the vent on top of the system.